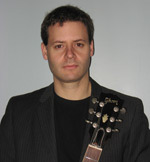 Rob DuBoff is an accomplished guitarist, transcriber, and music editor having transcribed and researched music for many fakebooks and solo books published by Hal Leonard. After graduating from Skidmore College in 1991 with a music degree he attended the New School Jazz and Contemporary Music Program in New York City where he studied with guitarist Jim Hall. In 1998 he took a break from music and completed a degree in Historic Preservation and worked as a preservation architect in Washington, D.C. and Albany, NY. In 2001 he launched ejazzlines.com with his brother, and more recently, they have built a distribution business and publishing company. Their business has become a leading supplier of jazz CDs, DVDs, books, and big band arrangements to colleges, high schools, and libraries throughout the world. 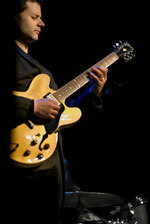 In 2006 Rob began playing again and now plays throughout the Capital Region with straight-ahead and progressive groups. He is available for solo concerts and club dates with established local groups.